The entry end of this rollforming line contains a prenotching press (at left) to produce variable hole patterns in the strip. That necessitates gag dies near the press feeds and a modulating drive on the straightener (center) to feed the loop. Plain and simple, rollforming is a different animal. The process strays from typical stamping as it demands long feed lengths and often an excessive amount of starts and stops as a variety of notching, punching and other tasks occupy the line prior to the actual rollforming process. All of this demands much from coil-handling equipment on the entry end, according to Jack Pennuto Jr. of Formtek, Inc., Cleveland, OH, a supplier of rollforming equipment including feeds and even entire lines. Programmable servo feeds enable precise starts and stops as well as the varying, and sometimes exceedingly long, feed lengths. The ideal rollforming line also would require either a straightener for a heavier-gauge product or powered uncloiler for lighter-gauge products, both with variable-speed or modulated drives to speed up and slow down to match large variations in feed length. And of course, feed systems designed with rollforming in mind do not limit users with regard to product length. Rollforming lines occupy more floor space than typical stamping lines owing to multiple roll stands used to form long products, with cutoff equipment at the end of the line adding to length. Entry-end equipment on rollforming lines also are longer than their stamping brethren, especially where prenotching and other processes occur prior to rollforming. Required strip slack may necessitate a pit to provide a significant material loop, more than an above-floor loop can provide. Coil-handling equipment may offer other features to meet the unique requirements of rollforming. For example, envision an architectural wall product, where profiles may be similar but widths vary. Then suppose that the product requires prepunching and strip-edge justification. The ideal servo feeder in this scenario can traverse inboard and outboard, explains Pennuto, to maintain a centerline on the servo feeder while performing edge justification on the tooling. And high line speeds, characteristic of some rollforming applications, may necessitate a wedge-type uncoiler to best control coil expansion by providing constant force throughout the expansion range. 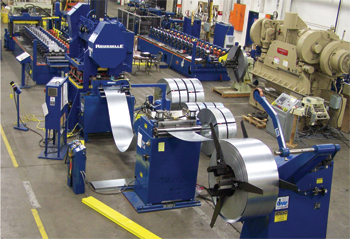 One rollforming company, Ferret Custom Roll Forming, Inc., Elkhart, IN, crams all sorts of work into its lines prior to rollforming, and employs many of the entry-end features described above. Formed in 1981, Ferret opened up as a rollformer of stainless-steel frames for commercial and industrial mirrors. The company, under the leadership of president and CEO Scott McMeekan, who purchased Ferret from his father in 2006, now serves the appliance market and also supplies parts for food-service, recreational-vehicle, commercial-furniture, retail-display and marine customers. Ferret, with 22 employees, runs 16 rollforming lines on one shift, some dedicated to specific products and others serving as workhorses. “We are a smaller company, but in rollforming you can do quite a bit with that-sized workforce,” offers McMeekan. Value-added is a of life at Ferret, which means packing as much work as possible onto the rollforming line to eliminate costly and time-consuming secondary operations on stand-alone machinery. 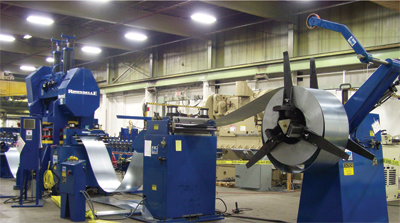 Note the length of this rollforming line, arising from the need for material loops and the use of inline processing equipment prior to the actual rollforming operation. Ferret outfitted its lines with equipment from Formtek companies, including Dahlstrom and Yoder line equipment from Formtek Metal Forming, Inc., Warrensville Heights, OH, and ServoMatic servo feeds from Formtek Maine, Clinton, ME. Materials rollformed at Ferret include hot-rolled, cold-rolled, galvanized and stainless steels as well as aluminum and pre-painted alloys in widths from 1 to 30 in., and in thicknesses from 0.019 to 0.205 in. Using his own company’s experiences, McMeekan points out how different prenotch operations can affect the type of entry-end equipment required. “A standard application, without varying patterns and employing a flying prenotch die—set on rails and pulled along by the material as it punches, then opening up and releasing from the material—typically would not need a powered uncoiler,” he explains. “The rollformer itself pulls the material off of the uncoiler, through the prenotching operation and into the roll stands.